Or a chevron between three martlets Sable. Sable a cross engrailed in the first quarter an escallop Argent. In a lozenge on her tombstone, Abingdon Church, Gloucester Co. Arms of Paget, not Page. Daughter of Matthew Page, above. Bookplate, 1703. Listed in Bolton and depicted in Sale's Manors of Virginia in Colonial Times, but there was no Francis Page of the Rosewell branch alive in 1703 and nothing on the bookplate to associate it with an American family. Or a chevron between three martlets Azure. But see entry above for arms as depicted on his tombstone. 1. Arms on original tombstone, now in vestibule of Bruton Parish Church, Williamsburg. See entries below for alternative blazons. 2. Tombstone, Bruton Parish Church, Williamsburg. Son of John Page, #1. 3. Tombstone of his wife, Mary Mann Page (d. 1707), now at Abingdon Church, Gloucester Co, Va. The birds are depicted with legs, unlike correct martlets. Son of John Page, #1. 4. On his tombstone, now at Abingdon Church, Gloucester Co, Va, with all three martlets erroneously placed in chief, impaling "Argent a fess dancetty [correctly a chevron] between three wheels Vert" (Carter). Son of Matthew Page, #3. 5. On his original tombstone formerly at St. John's Episcopal Church, Richmond; now replaced. Son of Mann Page, #4; governor of Virginia, 1802-05. 6. Tombstone, now at Abingdon Church, Gloucester Co.
7. On her tombstone, Bruton Parish Church, Williamsburg; daughter of Francis Page, #2; married to John Page, no apparent blood relation. Or a fess dancetty between three martlets all within a bordure Azure. 1. Arms on his tombstone show no bordure. 2. Great-great grandson of John Page, #1; brother of Governor John Page (see above). Arms on tomb at Rosewell. 3. Arms on his tombstone show no bordure; see above. 1. Descendant of Paine of Market Bromwich, Leics. Matthews does not provide the tinctures of the charges. Signer of the Declaration of Independence; arms on his bookplate. Argent on a fess Gules between three martlets Sable three mascles Or, all within a bordure Gules bezanty. Tombstone of his wife Elizabeth (d. 1704), King's Chapel Graveyard, Boston, impaling "Barry of six over all a bend"
Arms on watercolor made for Ezra Palmer. Or two bars Sable the upper charged with two trefoils slipped Argent and the lower with one, in chief a greyhound courant Sable. Guy and Edward were brothers, possibly of the family Palmes of Naburn, Yorks. 2. Arms on his seal with a crescent for difference. Heraldic Journal speculates that the chief should be Vair. Crozier suggests that the two men may have been brothers. Memorial tablet to all five successive fathers and sons, St James Episcopal Church, Goose Creek, S.C.
Embroidery in collection of Boston Museum of Fine Arts, impaling "Argent three lozenges [Azure?]" (Freeman). There were several Parker-Freeman marriages in Barnstable Co during this period. Crozier blazons the cinquefoil as Azure, presumably in error. 3. Seal on a will witnessed by Humphrey Parsons, 1702. Arms of Sir Thomas Parsons of Great Milton, Oxfordshire, knighted 1634. Brother of John, 1st Lord Pawlet, who inherited the Westover estate; they both came to Virginia in 1618. Per fess nebuly Gules and Azure in chief two suns in splendor and in base a garb Or. Seal and tankard devised by his will, dated 1711. Arms on his seal. Bolton assumes the field to be Argent. Arms on tombstone, which shows no tinctures; tinctures as assigned by Vermont. 1 and 2. Brothers. Vermont links them to the Pecks of Belton, Yorks. See variant below. 3. Carved on his tombstone, which shows no tinctures; tinctures as assigned by Bolton. Vermont links him to Peirce of Glencanny on Hillywater, nr. Enniskillen, Ire. From his seal. See quarterly version below. Arms said to have been granted in France, 1571. Argent a bend between two mullets pierced Sable. Ermine on a canton Azure a pelican vulning herself Or [or proper]. 1. 1st Lord of Pelham Manor. Arms on tablet dated 1697 in Trinity Church, New Rochelle, N.Y.
2. On his seal, and tricked on document found under cornerstone of old church at Pelham signed by him and his wife, pre-1700. Argent a chevron between three buckets Sable hooped and handled Or. 2. In a volume of his sermons, published 1727. Tinctures prescribed by the General Assembly, 1 July 1809. See [[State.Pennsylvania">our article on Pennsylvania's arms. In use by April 1777. Early emblazonments (the state seal, banknotes, other engravings, and a painting in the chamber of the state Supreme Court) all show the tinctures given here. See [[State.Pennsylvania">our article on Pennsylvania's arms. Arms of Penn (see above) used as arms of dominion on provincial seals, boundary markers, proclamations and statutes, etc. Sometimes with a crescent in chief for difference. 1. Founder and first proprietor of Pennsylvania; arms on his bookplate, seal, and many official uses. Sometimes shown with a crescent in chief for difference. 3. Grandson of William Penn, #1. Governor of Pennsylvania, 1763-71, 1773-76. Arms on his seal impaling "Per chevron Gules and Ermine in chief two lions' heads erased Argent" (Allen). 1. Son of William Pepperrell above. The canton is an augmentation of honor for his role in the capture of the French fortress of Louisbourg in 1745; he was created a baronet for the same service in 1746. Arms on the confirmation of the arms, his bookplate, engraved on baptismal basin donated to First Church, Kittery, and tricked in the Gore Roll of Arms. Acting governor of Massachusetts, 1757. 2. On his hatchment with the baronet's badge in chief point and the arms of Royall ("Azure three garbs Or") on an escutcheon of pretense, St Mary's Church, Upper Froyle, Hampshire. Born William Pepperrell Sparhawk (q.v. ), grandson of Sir William Pepperrell, #1; changed his name in accordance with his grandfather's will by private act of the General Court of Massachusetts, 1773, and assumed his arms. His grandfather's baronetcy was re-created for him in 1774. 1. On his tombstone as ordered by his son William (see also next entry) in a letter of 1735. Bolton erroneously identifies the tomb as that of the son. 2. Used by him prior to 1746. President of the colonial council, 1609; deputy governor, 1611. Youngest son of the 8th Earl of Northumberland; also shown with a cross moline in fess point for difference. An 18th century embroidery in the collection of the Conn Hist Soc. 1. Matthews blazons the charges Ermine instead of Ermines, probably in error. 2. Served in Revolutionary War. The sword may be intended to be proper. Seal on letter to Gov John Winthrop. Executed 1660 for his role in the overthrow of Charles I.
Seal on his will; possibly Scottish arms of Yeoman. Azure upon a terrace Vert a tree between two sheep grazing proper. On a tankard made by Jacobus van der Speigel (1668-1716). Vermont says "The present [ca. 1886] head of the family does not countenance the addition of the two sheep, arg." See other versions above and below. Bookplate by P. R. Maverick. See other versions above. On his seal brought from the Netherlands. Bolton assumes the field should be Azure, Crozier Argent. See other versions below. Sable a cross engrailed Or in the second quarter a mullet Argent all within a bordure Ermine. Same arms as various Peyton families from Cambridgeshire and Kent. Argent a lion rampant Sable between six cross-crosslets fitchy Gules. Adopted by the city council 1789. Adopted by the city council 1701, engraved on the city seal and on a medal presented to Col John Armstrong, 1756. Also on a 1720 painting of the city by Peter Cooper but in different tinctures. On a standard made in 1775. Raised as "Light Horse of the City of Philadelphia," later redesignated "First Troop, Philadelphia City Cavalry." Azure issuant from a ducal coronet a demi-lion Argent ducally crowned Or. On his bookplate and engraved on a teapot. First lord of the manor of Philipsburg, granted 1693. Vermont blazons the coronet from which the lion issues as a French viscount's coronet. 1. Entry in the Gore Roll of Arms, dated 1711. 2. Impaled by arms of Jackson on a paper filigree emblazonment made by his granddaughter Sarah Jackson, dated 1734. Arms confirmed to his brother Rev George Fitzpen alias Fippen of Truro in the 1620 visitation of Cornwall by right of descent from Henry Fitzpen of St. Mary Overy, Devon. Also on a copy made in 1768 of a genealogy drawn by David's son William, but with the bars very pale blue and the escallops gray. Seal on various probate documents. Although no tinctures are given, Her. Jl. 4:29 attributes these arms to the family of Bradway based on the design. 1. Seal on his will, 1695. See variant above. Governor of Massachusetts, 1692-94. 2. Gore Roll of Arms. Born Spencer Bennett, adopted by his uncle Sir William Phipps and took his name and arms. Acting Governor of Massachusetts Bay 1749-53 and 1756-57. See variant above. 1. Governor of Massachusetts, 1692-94. See variant below. 2. Engraved on "A Prospect of the Colledges in Cambridge," ca 1739, dedicated to him. Born Spencer Bennett, adopted by his uncle Sir William Phipps and took his name and arms. Acting Governor of Massachusetts, 1749-53 and 1756-57. See variant below. These arms also appear inexplicably on the tomb of David Wood, d. 1762, in the Phipps Street Burying Ground, Charlestown, Mass. 1. Engraved on a tankard made by E. Winslow abt 1690, with initials W[illiam] and H[annah] P[ickering] added 1695-1700. 2. "Hatchment" embroidered by his daughter Sarah, dated 1753. 3. Silver seal. Son of Timothy Pickering, #2. Arms of the Dukes of Kingston and Earls Manvers (line extinct 1773). Governor of Connecticut, 1766-69. Arms on his seal and on a sampler by Jerusha Pitkin (his niece?) ca 1750-55, Conn Hist Soc. Arms on his seal; Bolton suggests these are arms of Saunders. "Ermine" is probably an error for "ermines," white ermine spots on black. Arms on tombstone, Dorchester Graveyard. See alternative blazon above. Azure semy-de-lis a lion rampant Argent. Quarterly, 1st and 4th Azure a lion passant and a canton Or; 2nd and 3rd Argent a fess Gules between a wheel Sable in chief and a heart Gules in base. See previous entry for alternative blazon. Quarterly, 1st and 4th Azure a lion passant Or; 2nd and 3rd Argent a fess Gules between a wheel Sable in chief and a heart Gules in base. See next entry for alternative blazon. Said by Crozier to have been granted 1672; probably referring to date of matriculation in Lyon Register of arms of Pollock of that Ilk, which are the same except for being garnished Gules. From Pontaubard, Fourmagnac (Lot), France. Azure a lion rampant Argent within an orle of eight fleurs-de-lis Or. Argent a fess Azure between three mullets Gules. Argent on a chief Gules two stags’ heads caboshed Or. Same arms as Popham of Shanklin, Isle of Wight, Eng. 1. With a crescent for difference. Argent on a fess Sable cotised Or three church bells Argent. Sable three church bells Argent a canton Ermine. 1. Vermont says descendant of Poultney of Miserton, Leics. Bookplate. Mayor of Philadelphia, 1775-76 and 1789-90. On an engraved portrait dated 1777, impaling "Sable a lion rampant and on a canton Argent a cross Gules" (Churchill). Bolton blazons the lion's gambs Sable, but they are correctly Argent and appear as such on the portrait. 1. Engraved on a 1755 map of the middle colonies dedicated to him; on his bookplate impaling "Gules a hand fesswise holding a dagger erect between two mullets pierced Argent." See quartered version below. Governor of Massachusetts 1757-60, Governor of South Carolina 1760. 2. On his bookplate impaling "Argent Minerva standing with a spear and shield [proper?]." Son of Thomas Pownall, #1. 3. Seals on letters of William and other family members. Gules on a pale Or between four lions’ heads erased Argent three lozenges Sable. Drawings in family from early 18th century. Also on a bookplate with no given name. Speaker of the House of Delegates, 1787. Embroidered "hatchment" by his daughter Susanna (b. 1757). If the 2nd and 3rd quarters are for Lawrence, the cross should be Gules. Same arms as Prescott baronets of Theobald's Park, Herefordshire. Ermines on a chief Argent three crescents Gules. 1. Arms on his bookplate. Mayor of Philadelphia, 1711-12. 2. Arms on his bookplate. Crozier's blazon omits the number of mullets. Arms on his bookplate; tinctures conjectural. On his bookplate. The discoverer of oxygen; immigrated to Pennsylvania 1794. The label is presumably for difference. 2. 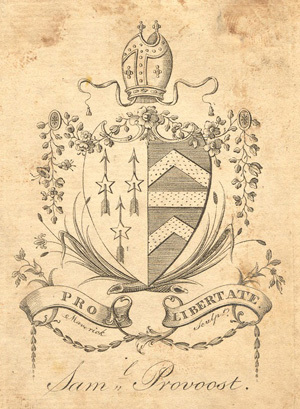 On two bookplates, one of which shows these arms impaling "Azure a bar between two chevronels Or" (Bousfield? ), the shield ensigned with a mitre. First Protestant Episcopal Bishop of New York; son of John Provoost, #2. Arms also engraved on a silver salver by Christian Feuter, ca 1775-1800. Bookplate. Possibly the same arms shown above for John Pumpelly without the chief. His father Jean Pompilie said to have been a Huguenot immigrant to Canada, originally of Italian origin. Embroidery by Betsy Putnam after painting attributed to John Coles, Sr., ca 1780-90. Possibly the daughter of Tarrant Putnam. Also an embroidery after the same painting by Sally Putnam, made ca 1790-1810. Per bend Argent and Sable three roundels within a bordure counterchanged. Per bend Argent and Sable, three roundels within a bordure engrailed counterchanged. Founder of Springfield, Mass. See next entry for alternative blazon.